Early attempts to create a vinery in Hatfield were unsuccessful due to the grape vines being planted in a frost pocket. 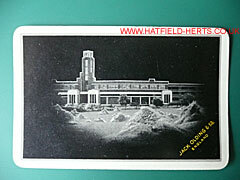 However, Hatfield did become a major centre in Britain's wines and spirits industry. Centuries ago, the first attempts to grow grapes at Hatfield House – using vines imported from France – were thwarted by planting them in what turned out to be a frost pocket (a cold spot). In the early 1970s, Hatfield became the headquarters of one of the UK's leading wine and spirit national wholesalers. Stowells of Chelsea Ltd took over the Jack Oldings site (shown on the back of the playing card in the photo but demolished in 1986, Tesco and a number of national chains have set up shop on the site). Occupying over 6 acres it became Stowells' headquarters, main production and storage centre. For the first time in the company's history all the departments – shipping, production, storage, planning, laboratory, distribution – were under one roof. Stowells' Hatfield operation used state of the art technology with three different bottling lines (the wine – mainly from Continental Europe – was delivered by tanker trucks), the fastest capable of 7,200 bottles an hour. Storage facilities were temperature controlled and held over 4.5 million bottles – over 3,000 different lines covering everything from vintage wine to vodka. The site was demolished in 1986, it is currently occupied by Tesco, Homebase and Comet superstores.